Fabulous ceiling light / lantern by Dominioni, one of Italy`s leading post war architects and designers. 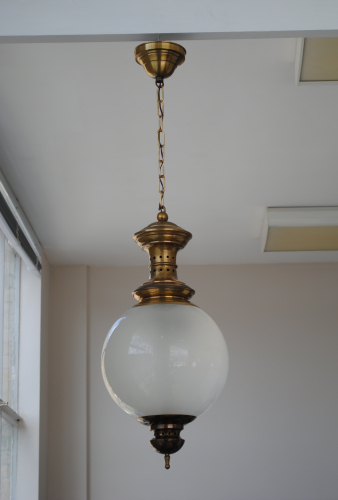 The brass elements incorporating the glass sphere measure 60 cm high by 28 cm wide and deep. The complete piece including chain and ceiling rose measures 100 cm high (maybe shortened by removing links in the chain).